If you want to know how to winterize your Winter outfit, then I am here to give you some advice. I want you to take a close up look at Winter dresses and how to wear them this year. The good news is that almost every dress can be worn during Winter months, of course, if it’s not a sheer frock or the one made of lightweight fabrics. How can it be possible to wear almost any kind of dress during cold season days? Layering. Yes, all you need is to layer your clothing. Try on long-sleeved gowns that can be covered by heavy knit sweaters, scarves, vests, cardigans, jackets or coats. We see a pretty LBD covered with a black long tailored coat. Complete this outfit by adding beige suede knee-high boots and aviator sunglasses. Personally, I use to wear my knitted dress atop skinny jeans or leggings. 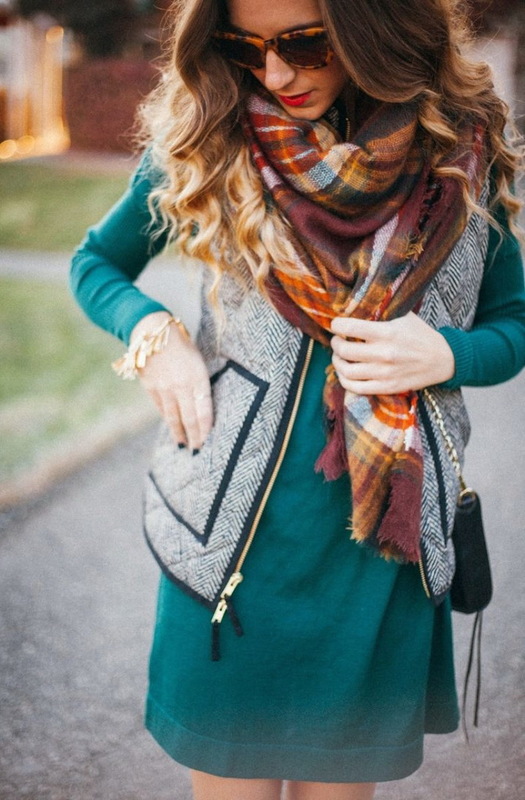 Layering your dress helps to trap body heat within the layers. If you are not into layering looks, then how about choosing cozy frocks? Go for a heavy fabric coat-dresses or choose a loose-fit knitted dress. Just because it’s freezing cold outside doesn’t mean you can’t wear your favorite dress. Scroll down to see all my favorite ideas to try this Winter.